Greetings from the heart of European Union! Now the three months in Brussels are over, and I had such a great time here! I worked at three “stages de kiné” (internships of physiotherapy). The first two stages were in the biggest hospital of Brussels, in the department of orthopedics to start with, then in the intensive care unit. The last one I did on the other side of the city in a trauma rehabilitation centre. All were interesting experiences and I got lots of knowledge from many different fields of physiotherapy. As a city I just love Brussels! It is a very lively and vibrant, international metropol with an air of a smaller town. What surprised me was the beauty: very pretty old buildings and nice parks all around. There is always something interesting going on, such as festivals, dancing, concerts, museums etc. In addition I have met many new people from all corners of the world. For the last time; xin chao! The time in Vietnam has passed very fast and my time in the exchange is going to end this week. I wouldn’t believe. The flight home came as fast as coming to Vietnam for the first time. At the same time I feel excited to go back home but at the same time I also feel I will miss my time here. I don’t know why, but at the moment I feel a bit empty and I have given my best effort for this exchange. My last practice has been at the ICU department at the Bach Mai hospital. Everything is new for me because I have no experience about critical nursing and of course the protocol and the equipement is different in some points. I still think I have done quite good; I have been observing a lot because sometimes you don’t have any practical job to do and some days I can do more like take blood samples and feeding the patients. Here in Vietnam practicing in hospital is very different than in Finland. My vietnamese friend and a english speaking nurse student has been a huge help for me here. Most of the nurses don’t speak english so you might guess how hard it is to understand or even do anything when we don’t understand each other. Big gas bottles on the hospitals’ yard. On my freetime I have gone around Hanoi and Vietnam. I have had time to travel also which is very nice. The latest I visited Phu quoc and Halong bay. Places were different but both beautiful. Small beach bar in a quiet beach in Phu quoc. Beautiful view from Monkey island in Halong bay. The best view in Vietnam. 1kilometer high in Cat ba islands national park. I think the biggest difference between Finlands’ and Vietnam practice is that in Finland everything feels organized, as a student I know what happens at the same week and month, in the practice there is someone professional to guide me. I think that exchange student who goes to Vietnam, has to be mentally orientated and very very independent, there will be a lot of cases when things won’t work as you wish so you need a looong nerves. I think the time here has also tought me a lot more calmness, I can cope with the unknown and I have learned to laugh (in my mind) to some situations that haven’t gone so well at first. But everything will be handled, it just takes more time usually. Many kilometers long mosaic wall in Hanoi. I hope I didn’t sound too rough but I know what I’m talking about. In my case I have done a lot of practical stuff in the practicies and also observed. I feel the biggest lesson here and in an exchange is not the practical stuff, it’s the things that happens inside, mentally. Vietnam is not an easy case, but when you handle it, you can be very proud of yourself. You have time to do practical things in Finland but nurses’ profession is a lot more and I really recommend Vietnam. Are you ready! Greetings from Manchester, England! Yes thats right. A British man from Finland has come home on exchange. I write this post after the awful events which occurred a few days ago in Manchester, therefore I am feeling very patriotic right now. Mancunians are flooding the streets getting a bee tattoo to show solidarity and to show that we have all come together. The bee is a worker bee and is a symbol of the city’s hard-working past, during the Industrial Revolution. It’s times like these I am so glad that I came back to this wonderful city and I am very proud to call myself a Mancunian still, after losing it somewhat whilst being away in Finland. Moving to a more positive note, my time here has been wonderful. My exchange has probably been quite different to most considering this is my hometown. I think it is fair to say I did miss out on a lot of the experiences others will have. My flight into Manchester was my standard yearly flight coming home for Christmas. Except this time I wasn’t coming back..for awhile. I didn’t actually tell my friends back here in England I was coming back for Christmas, but after New Year. This lead to a delightful surprise visit from me during the traditional Christmas Eve drinks. After some stressful organising I managed to get my modules in check. Things took a long while before getting everything sorted (others had the same problem) which is something I warn others about before applying here, although it was worth it, I swear. The University is Salford, I probably should mention that.. After confirming my modules, I was ecstatic to announce that my entire studies would be based at Media City UK. Home of the huge and most popular TV stations BBC and ITV. The modules I picked were scriptwriting, editing and TV drama. TV drama was the main module which I wanted to pick so I was delighted that it was still available. Finding things to do was much easier than what others may experience here. I have a big group of friends here already, however I did my best to mingle with the other exchange students. My home was about an hour and a half away from the University on the bus, an hour away from student accommodation’s. It was hard to keep in touch with everyone whilst I was there so my biggest advice would be to live as close as possible to the campus and its people. This way there would be no way in missing out on activities and things like that (I don’t mean drinking I promise.) One thing I did not miss about being in Finland were shop prices! It was nice to be back in a country where I could pick up a broccoli for 45p! I also enjoyed being able to chat to shop workers etc more easily rather than in Finland because of no language barriers. I don’t speak Finnish so I don’t fully know whether conversations are had like this, but I certainly enjoyed asking the shop worker whether hes “alright? !” and whether he watched “the game” last night. Being in Manchester I went to watch Manchester City play several times, went to wrestling shows and took part in any social activities I could do. I got to say goodbye to a hero and meet two new heroes. Not all heroes wear capes..they wear moustaches. Manchester City vs West Brom. Zabaleta’s final game. Being at this university has been an amazing experience. It is certainly something I will be referring to for a long time in my life. The classes have not been anything special, but I have enjoyed them all the same. The workload has certainly been different compared to TAMK. Classes have been much shorter. 3 hours Monday, Tuesday and Thursdays. However they expect you to do a lot of work outside of these times. 90% of my work has been projects on my own, which is something I am not used to recently in TAMK. My original understanding was that TV drama would be a module where you create a number of different pieces in a big team together. It was actually a module designed for me to be the producer of a film and produce a 5 minute short film. The workload was then increased when I was informed I would be directing another piece also. Getting a crew together with a cameraman, actors, director and sound is probably one of the most stressful things I’ll ever do in my school life. It was difficult getting involved in the majority of the classes as I was the only exchange person in them. I did enjoy however pretending to be the greatest Mancunian of all time.. it didn’t last long. Scriptwriting however was a completely different ball game. Every class we read out loud each others scripts in a big semi circle. Being British helped me out a lot here considering English is my mother tongue, however I can’t help but wonder what it would have been like for a foreign exchange person. This was by far my favourite module as I thought the teaching was fantastic and it was so refreshing to see someone care so much about your work. Unfortunately the only picture I took during filming! My conclusion about the country? Come to England before it’s too late, stop the Brexit! My conclusion about the city? Manchester, I love you. 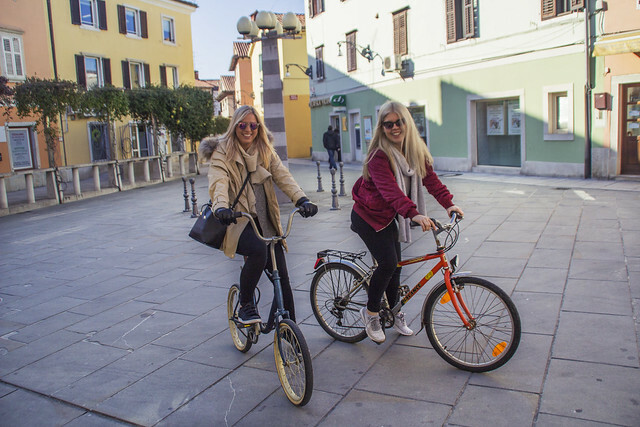 We are two girls from Tampere, and we are currently doing our exchange in Koper, Slovenia. 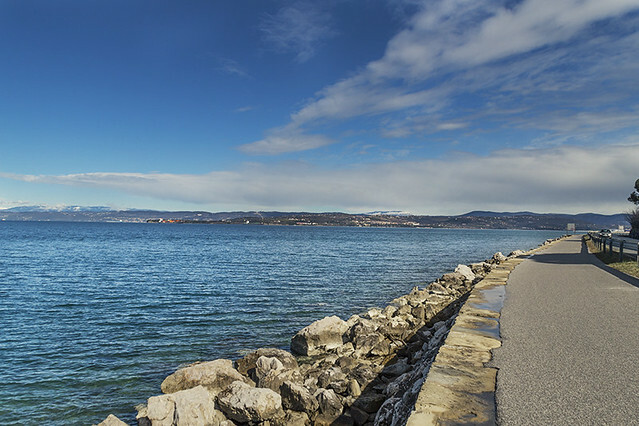 Koper is the biggest city in Slovenian coast, and it’s located just 10 minutes from Italian border and 20 minutes from Croatian border. This city is bilingual, locals speak Slovenian and Italian, and their English is also good. 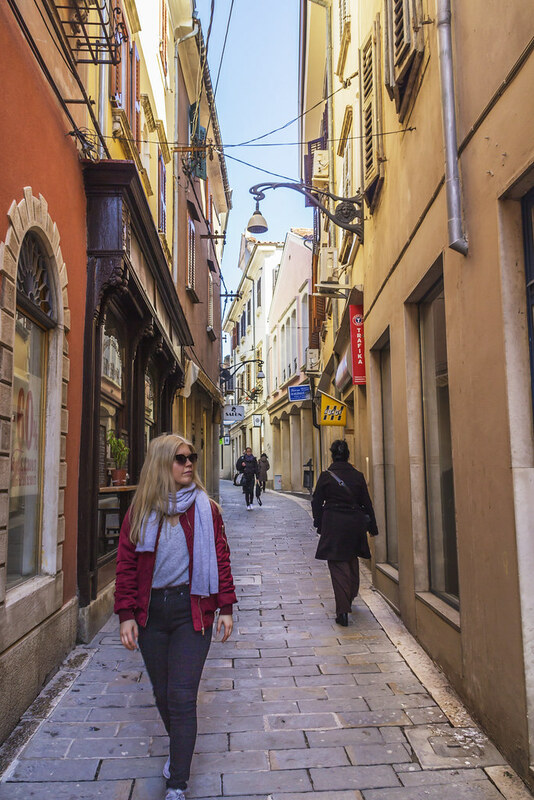 Slovenia is much cheaper than Finland, which has allowed us to travel, shop and eat out more than at home. The time is one hour less than in Finland. The weather here has been much warmer and sunnier compared to Finland. Even though the locals say, that this spring has been really cold here, we have been sunbathing already for over a month. Koper looks like small Italian town, with its narrow alleys and colorful houses. 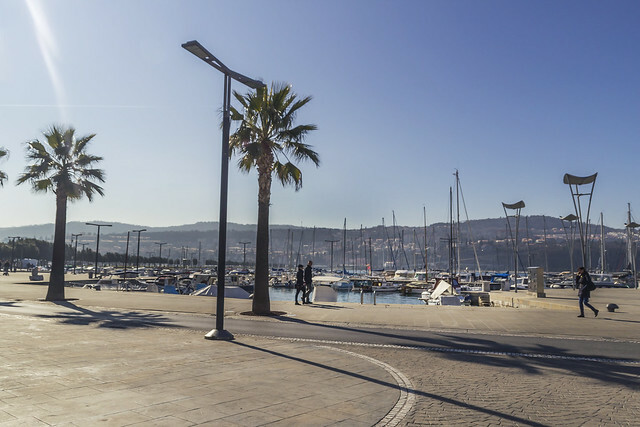 The best thing about Koper is its location next to the Adriatic sea! We are studying management and our courses here are concentrating on strategic management and entrepreneurship. From our courses we get 24 credits. One semester is divided in two periods, just like in TAMK. In the first period, we had only one course, and because of that we had only one or two classes per week. In this period we have two courses and classes 2-3 times per week. Studies have been easier than in Finland, but the study methods are the same. We have made many essays and presentations during these courses. Before we came, we thought that we could learn Slovenian in school, but they didn’t offer any Slovenian language -courses in the spring, so that was a little disappointment. School food system is different than in Finland. Here we get this Studentski boni, which means, that school co-operates with many different restaurants who give students discounts. For example in our favourite restaurant, a big salad/pasta/pizza etc. costs only 3,07€. And if you feel like eating junk-food you can go to McDonald’s and get burger, fries, drink, fruit, salad and ice-cream all just for 2,70€!! So as you can guess, we really like this system here, because you can choose from many different restaurants. You can find these restaurants all over Slovenia. Here is also good opportunities to exercise. School offers discounts to gyms, swimming halls etc. If you want to do your workout outside, here is this free sport park, Bonifika, where you can find football, tennis and basketball courts, running tracks and outside gym equipment. Visiting lake Bled with our closest friends. We live in city center with four Slovenian girls. Our rent is student-friendly, only 160€ per month per person. We are really happy with the location of our apartment, as we can reach everything in few minutes. Our basic day without school consists of going to gym or running, and meeting our friends. Life in here is extremely relaxed which has been quite difficult to get used to, because it’s so different than our lives in Finland, but we have started to love it! The best things here are our new friends and the opportunity to travel a lot. We have traveled around Slovenia, Italia and Croatia and visited also Greece and Austria. After the school ends, we are going to Split, Croatia and to Bulgaria. Most of the trips we have done by bus, which is the cheapest transportation, but if there has been a bigger group we have always rented a car. Even though Koper is a quite small town, here is one big shopping mall, Planet Tuš. There you can find cinema, bowling, restaurants, night club, gym and all our favorite shops (ZARA, Stradivarius, Bershka, New Yorker, H&M etc.). Best regards from Marja & Ronja! Where the craic is mighty! Ireland, the land where strange tales begin and happy endings are possible! They say that times fly when you’re having fun – Which is very true in my case. I was almost five months in Ireland having the most wonderful time in my life and can’t believe it’s over now! I lived in a little town Athlone, in the midlands. School where I studied is Athlone Institute of Technology and I liked it very much. Lecturers were very friendly and there was a lot of exchange students from different countries. The courses I chose were about tourism and hotels, also including revenue management and professional/enterprise development and I liked those courses a lot. There was four other erasmus students in my class so it was nice to study also with Irish students. I took a English for studying skills- course to support my studies and I think those classes were my favourite. The English lecturers were so friendly, always so positive and welcoming and it was nice to learn with so many different nationalities and have interesting conversations during the classes. One thing I found challenging there. In Finland we do most of the assigments in teams, but here almost everything was individual. First it was hard, but by time it became easier and I found the best ways to study. We had to do different reports, project, wordbook, essays and at least five different presentations and after submitting the last one, I felt so proud and relieved. Also the final examination weeks were hard trying to read as much as could and exam situations were different compared to Finland. During the semester, I got so many new friends and spend amazing time with them. Many times when we had free time, we spend time in a pub next to our apartment playing pool and enjoying Guinness or going to parties organized by International society or other erasmus students. I think that always people who you meet wherever you go, makes your time there. That semester wouldn’t been the same without all those lovely people. During that time, I saw a lot of beautiful Ireland. And I really mean beautiful. Green scenery everywhere, numerous mountains and cliffs, fields with sheeps and the coastal roads with ocean views. Seriously breathtaking country which I fell in love. Definitely going back maybe after few years to experience the whole Wild Atlantic way and other cities I didn’t see. I made trips when having free time. International society organized few trips to erasmus students to Cliffs of Moher and Wicklow national park. Also in St. Patrick’s day, there was three buses full of exchange students going to Dublin to celebrate. With friends I made trips to Dublin, Galway and to Belfast and all those cities were so nice. Including to our courses, we made fieldtrips to Dublin, Westport and Clonmacnoise visiting different attractions and learning about tourism. Everywhere was a lot of activities and attractions for tourists and sometimes it was difficult to choose what to do and see. To people who are thinking about going to Ireland, I can only suggest that lovely country! Not only because the scenery, but also because the Irish people, culture and way of living! It has been a amazing adventure I have had here this far and now it is almost time to go home already. Time flies when you are having fun! Institute of Technology Tralee (IT Tralee) is a bit different than TAMK. The lectures lasts only an hour and the examinations are very strict. The courses’ final examinations are as strict as the matriculation examinations are in high school. There is only two semesters that equals to two periods, not like in TAMK with 4 periods per academic year. The Starbucks cafeteria in the North campus has a nice view to the mountains, and is has been nice to see the mountains where ever you go in Tralee or how I have noticed, anywhere in Ireland. The courses I had here were mostly marketing courses, but very different that those I had in TAMK. Sometimes the lecturers just did not show up but that happened to me only once. Some other course teachers were gone for most of the time without any note. I have travelled around Ireland and visited also in Edinburgh, on the holidays and weekends. The nature here is wonderful and yet it amazes me every time how green it is here. Anywhere you go, for example from Tralee to Dublin, when you are sitting in the train, every 30 seconds you see either cows, sheep or horses. The sheep are everywhere, it is true that they can lay anywhere. Ballyseedy wood was only for a 15 minute cycling away from the city centre. If ever going to Ireland, I recommend to rent a car. The public transport is not at the same level what it is in Finland. Cliffs of Moher was beautiful and no wonder why it is a known place in Ireland with Giant’s Causeway. After getting used with the accent of the Irish people it was easy to understand the people. For example our bus driver on the Northern Ireland trip, he was from Kerry, and he had strong Kerry accent, and for awhile it was almost impossible to understand what he was saying, but I got used to to the accent pretty fast. The day trip to Dingle was the first one I did and I was impressed about the view there. Definitely worth seeing. The people that I have had the chance to get to know here are so great! They have made the studying and the small town Tralee feel like another home. So as they say cheers in Irish, Sláinte! Greetings from the Herzo base! Closing in on three months since I started my internship at adidas in the town of Herzogenaurach, Germany so it´s about time to take a look back and blog about my experience so far. Things turned out well for me as I was able to start my internship right after finishing my exchange semester in Heilbronn. The relocation wasn’t that huge either, roughly 200 kilometers. What I found most difficult was the accommodation. Herzogenaurach being a relatively small town with little to no shared flats or other student friendly housing, I decided to set my sights on finding a place in the nearby city of Erlangen. Many employees of adidas also live in Nürnberg and the company has arranged a private bus line to bring people to work and take them back home, but I’m not a big fan of being depended on bus schedules. So it had to be Erlangen for me. Turns out, the housing situation in the whole area is quite bad, with Erlangen being a popular university city and the Erlangen-Herzo area having other big companies like Puma, Siemens and Schaeffler. I got a place for a month in the center of Erlangen and it took me the whole month to find a permanent one. Commuting by bike feels like a pain sometimes, especially when it’s raining, but hey, I didn’t want to depend on schedules. Alright, back to my internship. So, I’m working at the adidas headquarters in the Global Logistics – 3PL Strategy and Management -department in the Procurement team. The team is responsible for inbound and outbound freight rates globally, we negotiate with carriers the freight rates to be used for a certain period of time. The project are long and demanding and the ultimate goal is of course to save as much money as possible, since adidas ships worldwide and the share of logistics costs from the overall costs is quite significant. During my first weeks I had a talk with my boss about my tasks and my role in the team. The outcome of that meeting was that even though I have no work experience in the field, I would still be responsible for certain things in the team, to get as much out of the six months of my internship as possible. The whole experience has been great so far and I see no reason why it wouldn’t be going forward. The work environment is great and so much more relaxed then one might expect from a German company, the normal office wear is jeans and sneakers. Not to mention the employee discount you get from adidas products. My wardrobe has never been so full of stripes. The company encourages a healthy and sporty lifestyle which is seen in the casual office attire, healthy foods offered in the cafeteria and a gym just outside the office. Walking around the campus, it feels more like a university than a company. You have flexibility in your working hours so you can take a break in the middle of the day and go to the gym, go jogging, play beach volley, tennis or basketball. I don’t usually take a lot of pictures, but I’ll see what I can gather. These two pictures were taken during the Global Brand Conference evening party. The cafeteria was transformed in to a disco and some light effects were added to a pond that’s inside the campus (and is also home to a family of geese, who sometimes get aggressive and chase people). The party had several artists performing and there was also free food and beer for everyone. And this is a pair of sneakers I wear around the office. Told you I don’t take a lot of pictures. I am now about halfway through my internship at Schenker Australia working in Product Management Air Freight based in Sydney. My team is responsible for the financial as well as operational results of Air Freight in Australia and New Zealand, including business and product development, budget planning, profit and cost savings and carrier management among other tasks. I have learned a great deal about operational as well as commercial side of air freight and freight forwarding. This experience has definitely confirmed that I’m on the right track and want to continue working in this field in the future. Working in a multicultural environment has been a great experience, in our office we have people from all over the world and we are in touch with our colleagues in Europe, Asia and America on a daily basis. Australian business culture is somewhat casual, people are called by their first name and general atmosphere is relaxed, yet work is taken seriously and appropriate business attire is expected in the office. Sydney is a beautiful city full of beaches, parks, attractions, activities and events, and of course friendly and super polite people. No worries –attitude is something I’ve absorbed very quickly, left-hand traffic took a little more time and proper Australian accent and abbreviations still manage to confuse me sometimes. The only bad thing I can think of Sydney are the high living costs. Accommodation is considerably more expensive than in Finland and everyone lives in shared flats or houses, it is common to share even your room with other people. Also life without a car is not made too easy unless you stay in CBD area. The city is huge with over 300 suburbs and almost 5 million inhabitants yet public transportation is not great nor cheap hence everyone has their own car and the traffic is pretty bad on mornings and afternoons. The winter is on its way this part of the world but so far the temperatures have stayed above 20 Celsius and as a Finn I’m not too worried about the Australian “winter”. Time is flying and there is still heaps to see in this amazing country. I hope to get an opportunity to do some exploring after the internship is over and enjoy the Australian summer as well!